We’ve arrived to a lovely English country setting in Wiltshire. a place called the Bishopstrow House. 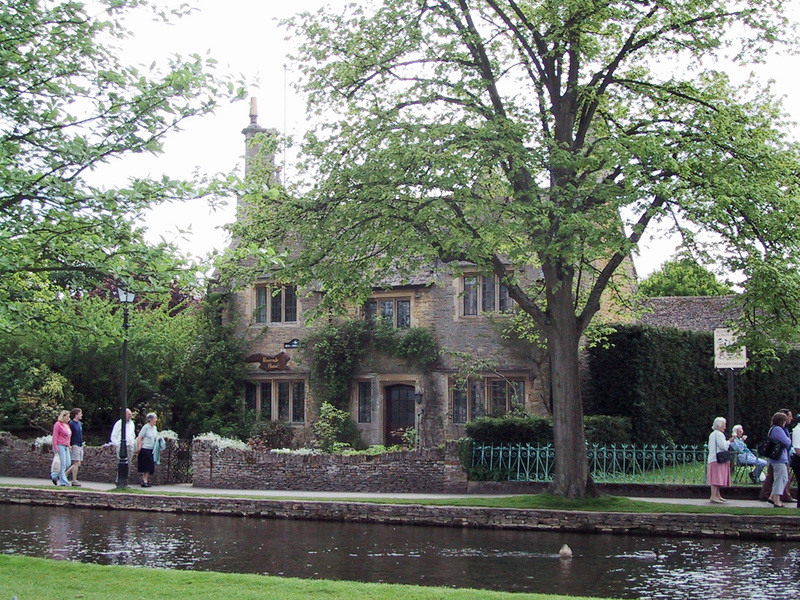 Wiltshire is one of the London “bridge and tunnel” communities in the bucholic countryside. The hotel has an exclusive spa and after the long travel we relaxed into a massage and a trendy haircut experience with the very zany Dianna, a local who cuts hair and sells black market caviar on the side. She entertained us for about 20 minutes with her rants about how she hates her husband, her accumulation of speeding tickets, her children and her holidays on the continent. All we had to do was sit there and listen. It all bordered on fascinating and exhausting. After wearing the same clothes for at least 10 days, we finally got to do the laundry. We got back the same clothes, but at least they were clean. We came up this way for the British countryside and to see Stonehenge. No matter how many photos or film you might see, you really don’t know till you’re there in person. It is spectacular. The first thing we noticed was the precautions agains the spread of “hoof and mouth” disease. We’ve come during a bad time in the UK. Over 10 million sheep and cattle were killed to try and prevent the spread of the disease. The hills were frightfully void of any animal life. Prior to entering the Stonehenge monument, we were obliged to rinse our shoes in an antiseptic wash. We repeated the shoe bath on the way out. This was a serious agricultural disaster and washing our shoes in an antiseptic bath was the least we could do to help. 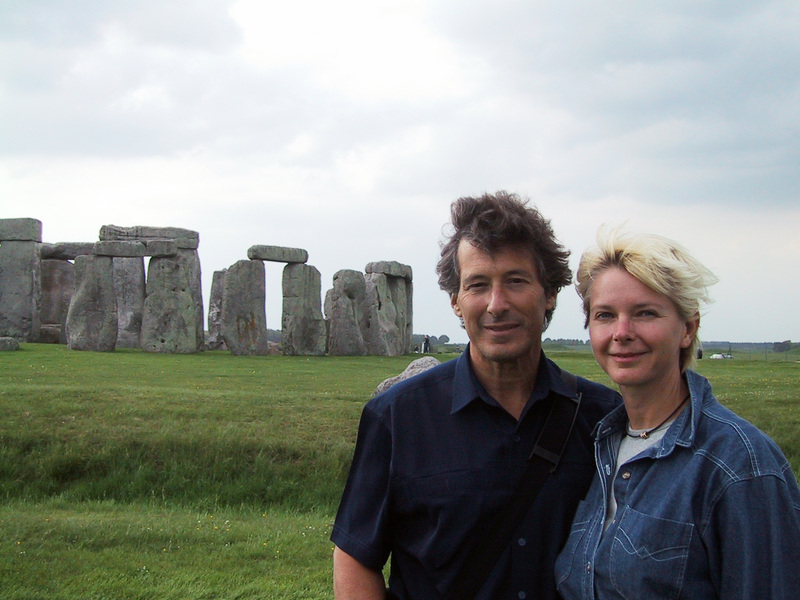 A “henge” is a prehistoric architectural structure, oval or circualr in shape. There are henges all over Britain. This one is the most famous. Archaeologist has estimated it was erected in 3200 BC. That would make it over 5,200 year old. There are lots of legends about what it is. One has the wizard Merlin moving it from Mount Killaraus in Ireland, where it was constructed on by Giants. The rocks were found in Africa and brought to Ireland because of their healing powers. Some say the devil put it there, some say it was build by extraterrestrials (there are still UFO sightings) while others thought it to be an ancient Roman temple. The most agreed upon theory is that is was a Druid temple for celebrations to the solstices and equinoxes or predicting lunar eclipses. New Age druids keep coming every year hoping something will happen. There was a pretty ugly confrontation in 1985 when the Wiltshire police stopped a Peace Convoy of about 120 vehicles from the setting up the Stonehenge Free Festival. The police smashed up the camper homes, chased the new age druids into a nearby beanfield and began beating senseless the defenseless men, women and children. Reports of the police brutality in the “Battle of the Beanfield” went worldwide. The White horses of Westbury are a great sight. They’re carved into the soft limestone hilltops revelaing a chalky appearance from a distance. No one is really sure of the origin. Some say the white horse goes back to the 8th century when the white horse was the war standard of the Saxons, some say it was to commemorate King Alfred’s victory over the Danes. King Alfred (871-899) who was born in The Vale of the White Horse. 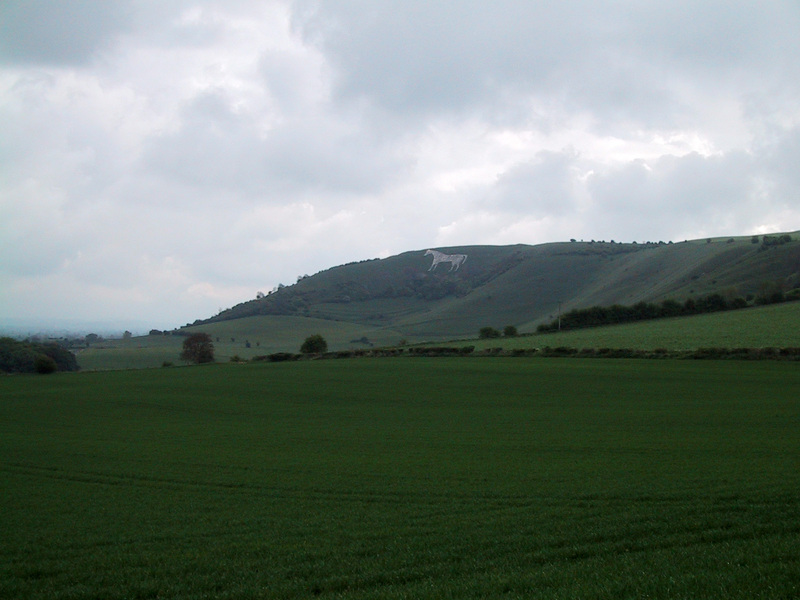 The Westbury horse (in the photo to the left) was restored over 300 years ago from a much older version. They are now national monuments and kept in restored and protected conditions. 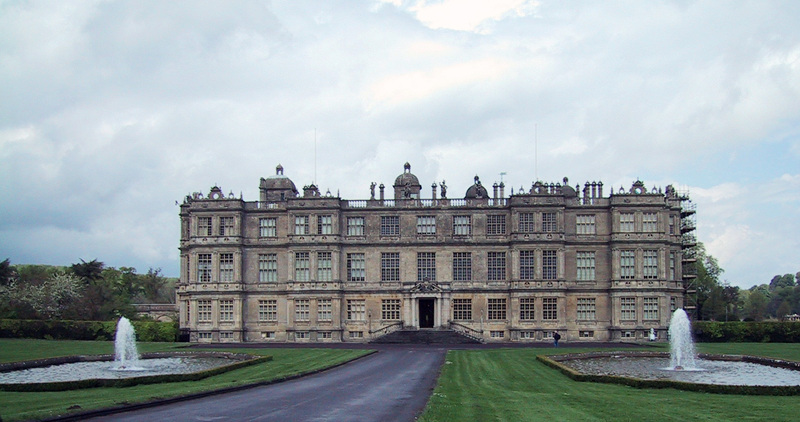 The Elizabethian Hall of Longleat was first opened o the public in 1949. It was the first stately home to open as as a tourist attraction. The manor was built in 1580 by John Thynne, who began his climb up the steps of English nobility as a kitchen clerk to King Henry VIII. It was through the royal courts where he met his future wife and joined the upper crust. King Henry had a fondness for the common man. John Thynne gained his knighthood after the Battle of Pinkie (now there’s an odd one) in 1547 against the Scots. His coat of arms features a knot in the tail of the Scottish lion. Much of the Longleat Manor is conserved with original furniture, boule tables, antique jigsaw puzzles, floors, walls, doors and painting. One of the family memeber, the 2nd Marchionness of Bath, (so we were informed) was the lady responsible for the nursery rhyme “London Bridges falling down”. She got very drunk during one wild night in London, stripped off her clothes and danced naked on the bridge. She managed to work up a good crowd to join her and as more people got into the dance, the weight weakened the bridge supports. The London Bridge is falling down my fair lady! The manor is also haunted by the ghost of a Marchionness who’s Russian lover was killed on the property. She has been roaming (and groaning) the halls looking for him. But even more terrifying than any ghost are the psychadelic kama sutra paintings of Alexander Thynne, the 7th Marquess of Bath and current owner. These murals cover his bedroom and other rooms of his apartments in a wing of the manor. 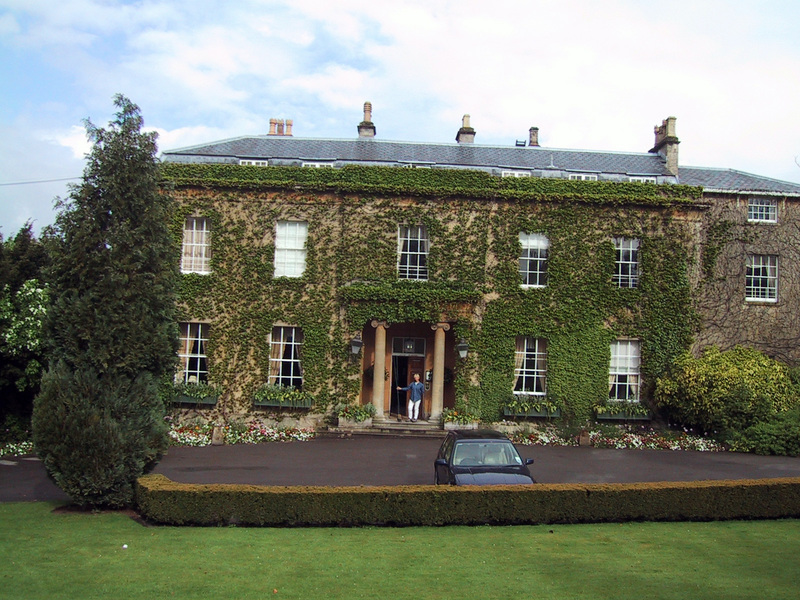 Lord Bath moved back into the estate in the late 1950’s. In 1966, in order to help pay the upkeep on the property, he opened up a drive through Safari Animal Park on the grounds which now include the Royal Maze, the Safari boat ride, the Longleat railway, the pet corner, Old Joe’s mine, Postman Pat’s village, the Butterfly garden and a motion simulator. It’s all approaching Disneyland status. The Safari and Adventure Park might be a bit too silly, but the Manor house is well worth the visit. 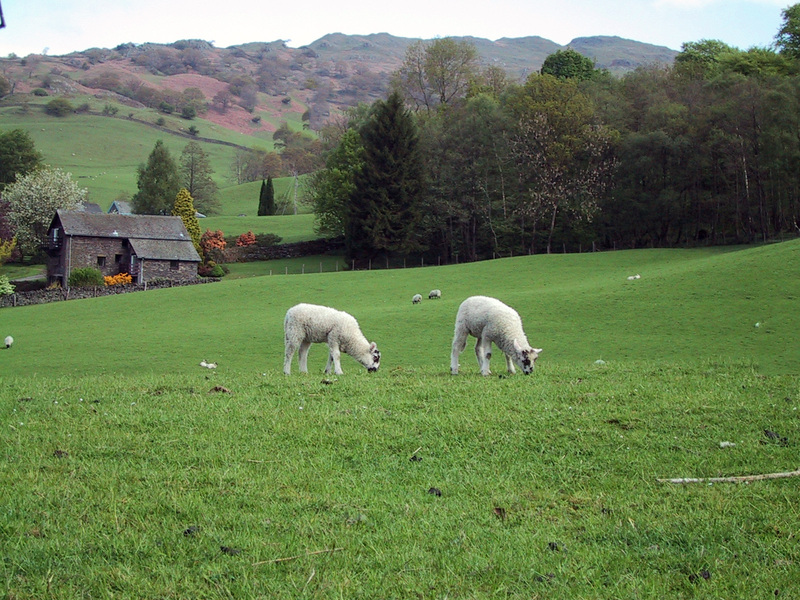 The hills of the Lake District are very quiet. The “Hoof and Mouth’ crisis has all but wiped out the sheep, cattle and the tourist business. By the time the epidemic was over, it cost the country over 15 billion dollars. 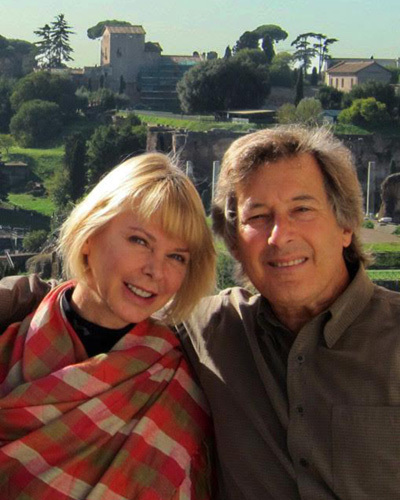 We looked across the bucolic fields that once were green pastures for herds of thousands. We were lucky to see a couple of sheep here and there. We arrived to Edinburgh Castle a little before noon. Right past the entrance gate was a scotch sampling booth. We stopped and got an education on how to let the magic fluid roll down your throat. “Too many people don’t know how to drink scotch” the proprietor told us. “You’ve got to let the scotch fall gently. Let is gracefully enter your throat. Only then you can feel how smooth it really is.” And it was. And yes, we bought a bottle. At 1:00pm we were entertained by the cannon salute. 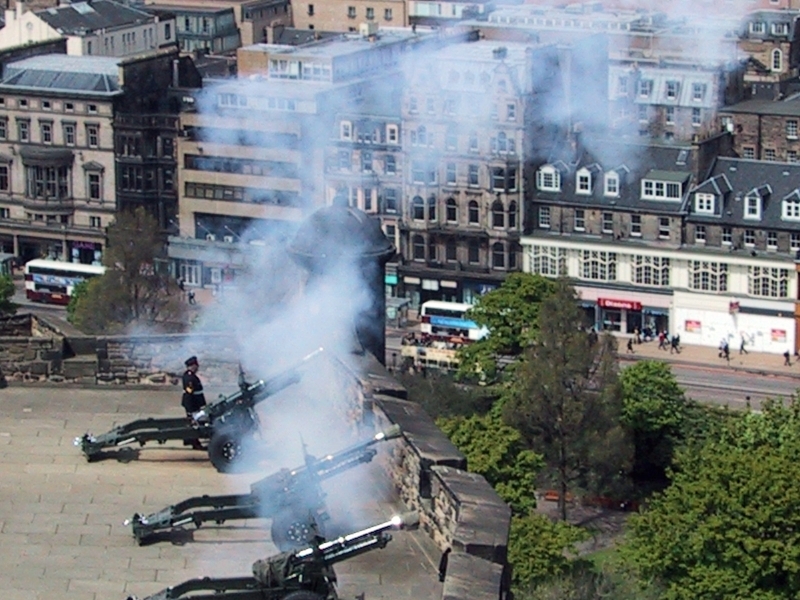 We were told that the Scots fire the cannons at 1pm every day instead of 12 noon because by firing at 1pm they only use one round. Those frugal Scots. 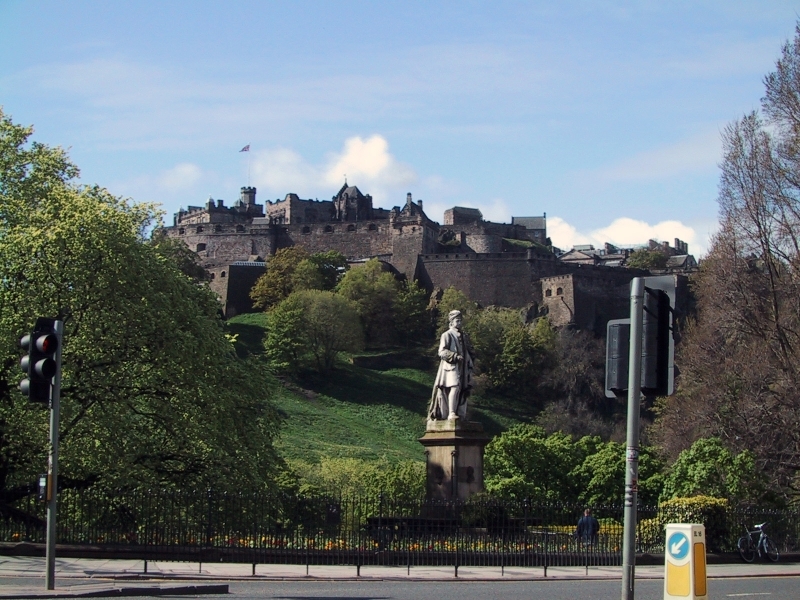 The Royal Mile connects the Royal Castle to the Palace of Holyrood House. This is the “old town” of Edinburg, a charming as can be 18th century village feel. Daniel Defoe called it the most beautiful street in all the world. Of course, Defoe did live on the street. By the time we reached the Holyrood House, it was closed to the Public. Prince Charles was in town for a visit and since this was his house, all visiting hours were suspended. The Scottish National Portrait Gallery is a great visit. When you see the portraits of people like William of Orange, James II and James III and Bonnie Prince Charlie, you really have a better understanding of the Catholic Jacobeans and the religious wars against the Protestant Tudors; nothing lik a good religious war. It’s a long drive from Edinburgh down to the Cottswalds and into the old city of York with all of it’s tourists , starbucks coffee shops, disney stores and other souvenir shops. There was a line worthy of an American theme park at the local viking exhibit; York was a 10th century Viking city under the Kingdom of Eric Bloodaxe (what a great name). At nay rate, we had to get away from the crowd and ducked into the town square which was relatively quiet for a minute till the brass band playing Cruella DeVille marched in. Where the hell are we? Yes, this is an adorable historic town filled with 11th century and half timbered Tudor buildings. This is the birthplace of Guy Fawkes, the man who tried to blow up the Parliament building. We expected so much, and although we did get a lot, it was actually a lot too touristy. 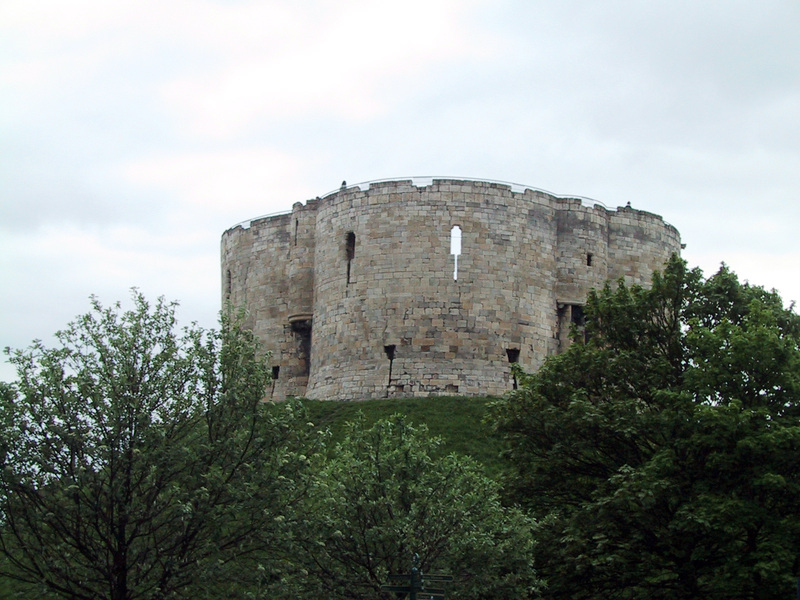 However, York was once a Roman settlement of Eboracum and remains of the 1st century Eboracum tower for the ancient fortifications is excellent. From York, we drove to Hereford to see the Mappi Mundi, the oldest maps in the world, dating back to the 13th century. The Hereford cathedral goes back even further to the the 11th century. The maps are more of a concept of the world than an actual map, since, let’s face it, there wasn’t much world exploration in the 13th century, except for maybe the Vikings, but we’ve never seen any Viking maps. The British love the Cotswolds, the rolling hills filled with small villages built of limestone houses. Busloads of British tourists (mostly elderly tourists) fill the quaint streets from April through October. It’s a perfect English outing; hiking trails, birding, villages, lovely lunch spots and more tour buses than you would possibly imagine could fit squeeze their way through the small streets.